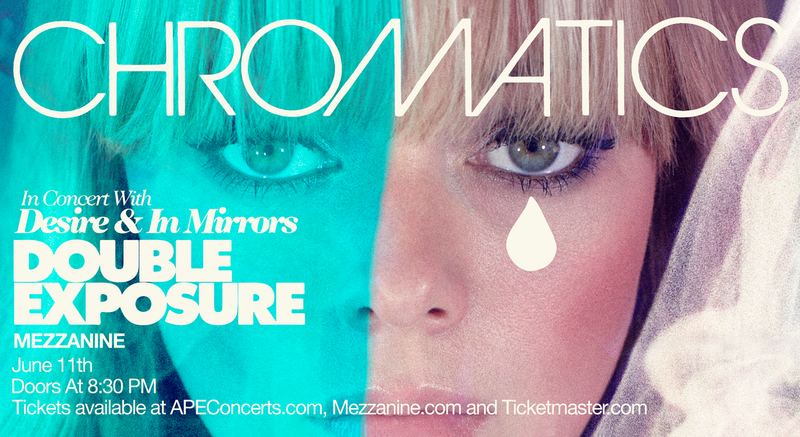 Chromatics announce their first public concerts in over 5 years. The last time Chromatics was on stage was for the filming of their Roadhouse appearances in David Lynch’s Twin Peaks. This six week North American tour will be the first time the band performs live with vocalist Ruth Radelet in many of the cities. Onstage, the group will be playing their favorite moments from Night Drive, Kill For Love, Cherry, & Dear Tommy. Montreal’s Desire will be performing in direct support of Chromatics. Front woman Megan Louise sings in French and English over Italo Disco laced Dream Pop. Their single “Under Your Spell” made a splash on the silver screen in Nicolas Winding Refn’s cult classic Drive alongside label mates Chromatics, Electric Youth, & Kavinsky. From Vancouver, B.C., Italians Do It Better label mates In Mirrors open the nights with their hypnotic brand of Minimal Wave, Krautrock, and Post Punk. Visually, the entire night features films directed by Johnny Jewel mixed live by video artist Danny Perez (Antibirth, Panda Bear). Bringing a cinematic experience to the concerts, the bands will be blurring the line between stage and screen.